Hasbro unleashed an early look at this year’s fall Nerf product line. The company introduced four new blasters, set to be shown to retailers for the first time at Toy Fair New York: the N-Strike Elite Titan CS-50, Rival Perses MXIX-5000, N-Strike Mega Megalodon, and Zombie Strike Revoltinator. This exclusive version of the Megalodon blaster includes 60 Nerf Mega Whistler darts—40 more than the original version. Kids can fire 20 darts in a row, launching one dart at a time or unleashing all 20 darts rapidly with slam-fire action. Tested to fire darts up to 85 feet. This colossal blaster is fully motorized for rapid-fire dart-blasting and boasts a huge 50-dart drum to unleash a massive, 50-dart storm. It includes 50 Nerf Elite darts. The blaster is compatible with most Nerf Elite dart clips, has integrated clip storage, and includes a strap. The Zombie Strike line expands with the Revoltinator, including Power Shock electronic lights and sounds. As kids power it up and fire, lights flash and glow in different places on the blaster, and it makes revving, blasting, and sparking sounds. 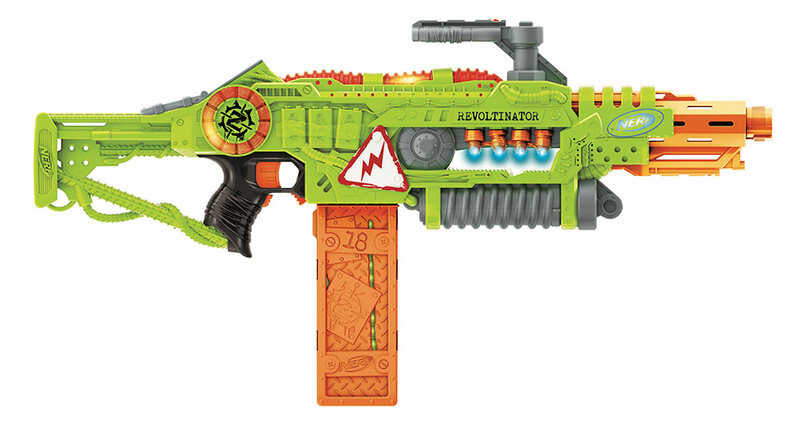 The Revoltinator includes an 18-dart clip and 18 Nerf Zombie Strike Elite darts. Kids can customize the blaster with additional Zombie Strike accessories, sold separately. Available in red or blue, this blaster features the fastest blasting Nerf Rival system, which fires up to eight rounds per second. The blaster includes a 9.6-volt 1200mAH rechargeable battery and wall charger, along with 50 official Nerf Rival high-impact rounds. The trigger lock prevents accidental firing. Hasbro will exhibit at The Times Center, 242 W. 41st St. during Toy Fair New York, Feb. 16-19.
this sounds like an awesome lineup this year. I have $600 saved up for the fall releases. these will all go good in my arsenale.